For many years after the pole vault was first offered to girls in Maine in 1996, there were very few athletes who cleared 10 feet at the outdoor track and field state championships. That’s been changing dramatically in recent years. From 2002 to 2011, the 10-foot milestone was reached by only 12 girls at the state championships for Classes A, B and C combined. In the five years since, 20 vaulters have cleared that height at the state meets. On Saturday, there will be as many as four girls competing in the state track meets who have already vaulted 10 feet this year. In Class A, Bangor senior Rihan Smallwood has cleared 10-61/2, and Scarborough’s Edie Christian, a senior, and Anna Gardner, a freshman, have cleared 10-0. In Class B, Old Town junior Oliviah Damboise has cleared that height. “There is better coaching and more pole vault coaches. And more girls are pole vaulting,” said Scarborough pole vault coach Paul Synder. The Class A meet will be at Massabesic High in Waterboro, the Class B meet is at Yarmouth High, and the Class C meet is at Foxcroft Academy. The Class A girls’ meet is expected to be a tight race between Thornton Academy, Cheverus and Scarborough, the state indoor champion. With the girls’ pole vault scheduled at the end of the meet, the event could be the deciding factor. Scarborough freshman Anna Gardner clears the bar Thursday afternoon during pole vaulting practice. 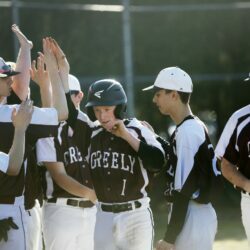 “The key to Scarborough girls finishing second at the SMAA was the vaulters going 1-2-3,” said George Mendros, Thornton Academy’s coach for the last 20 years. 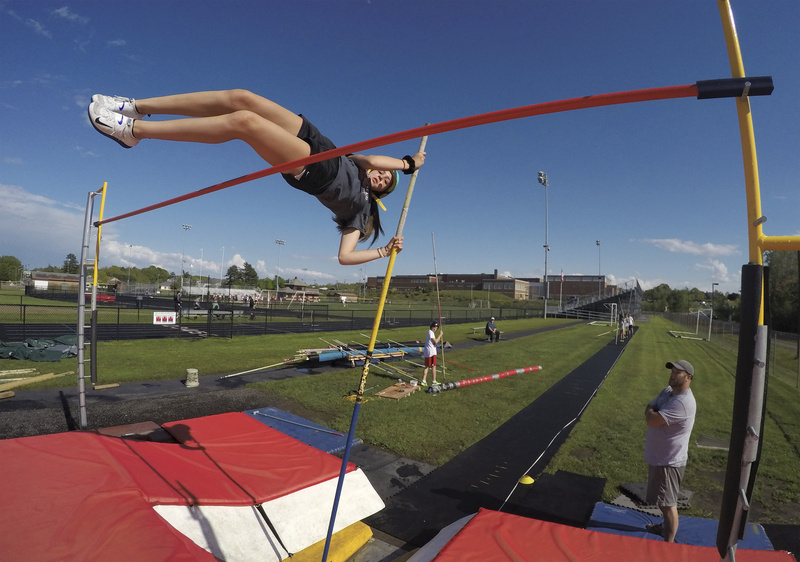 The girls’ pole vault started to gain attention when Cony’s Bethany Dumas – who holds the outdoor state record at 12-0 – won the event four consecutive years (2005-08) in Class A. She also won the New England outdoor title her junior and senior years. “Bethany was the reigning queen of the pole vault,” said Diane Fournier, the Class A meet director and Mt. Ararat High’s coach for 43 years. Fournier doesn’t think the number of girls clearing 10 feet today is a coincidence. She believes more girls want to vault. 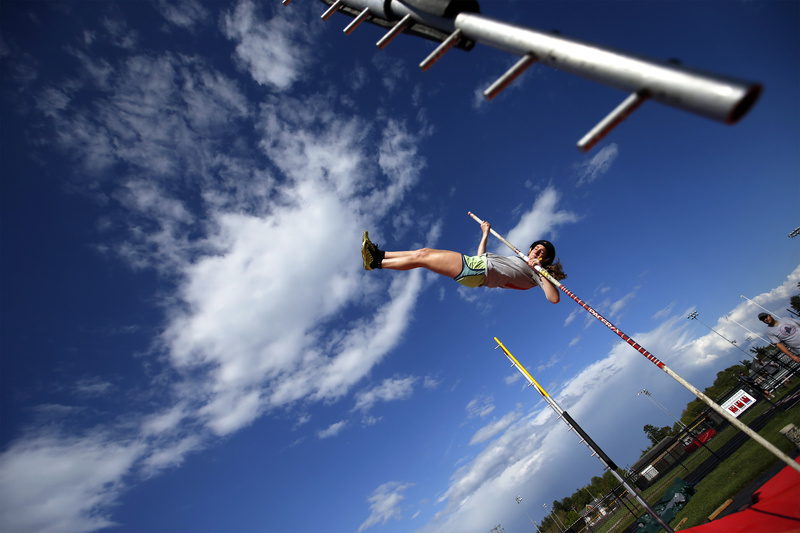 Scarborough senior Edie Christian goes airborne Thursday afternoon during pole vaulting practice. There’s no question more Maine girls are soaring over 10 feet since Dumas graduated in 2008. 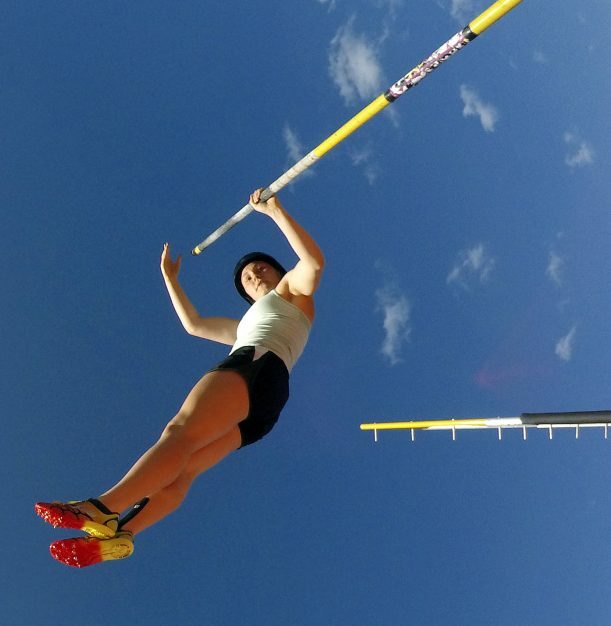 Lindsey Folsom of Cony won back-to-back state titles in Class A in 2012 and 2013, vaulting higher than 11 feet each year. Then, each of the next three years, at least two girls cleared 10 feet at the state meet. Mendros also credits the improvement to better coaching. 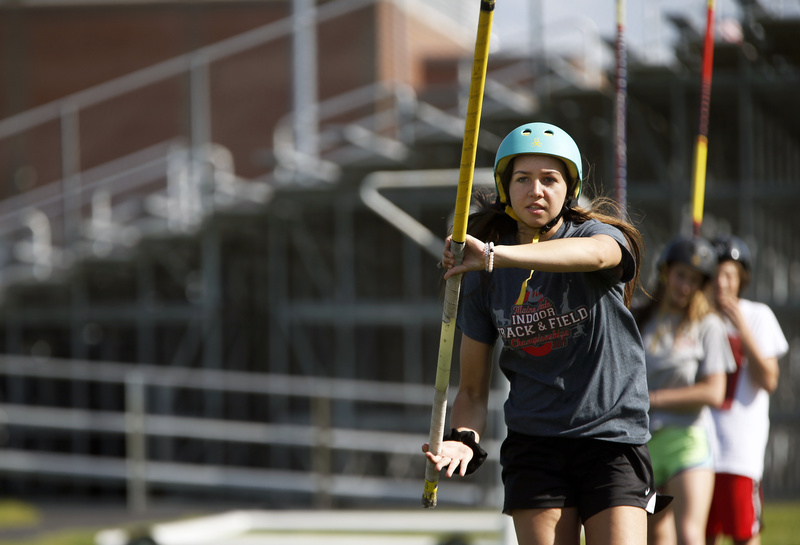 Scarborough freshman Anna Gardner starts her approach Thursday afternoon during pole vaulting practice. However, Snyder, who coached Dumas, thinks it’s also changing times. He said in the past 20 years, the era of the adventure-athlete has firmly arrived in girls’ sports.